... there was no shortage of explanations for the smiling faces in the paddock during the Official Test Days for the CIK-FIA U18 World Championship and the Academy Trophy. When all the sessions were over and after more than 160 laps had been completed, the fastest proved to be the British driver Benjamin Barnicoat, heir apparent to Leclerc last year in the Academy Trophy and also member of the ART GP team. With 10 drivers no more than 3 tenths of a second apart, differences were at a minimum and several other drivers stood out, like the Finnish Jussi Kuusiniemi (Haase), the British driver Ricky Collard (ART GP), the Italian Armando Iannaccone (Parolin), Tuomas Tujula (Haase) from Finland, Charles Leclerc (ART GP), the Swiss driver Severin Amweg (ART GP), the Russian Georgy Antonov (MS Kart), the Ukrainian Oleksandr Tkachenko (Zanardi) and another Finn, Aatu Moilanen (Haase). In a little less than a month’s time, on the track at Braga in Portugal, all of these drivers will be back among their other rivals who did not take part in these Test-Days to kick off a championship which promises to be extremely exciting! The same applies to the CIK-FIA Academy Trophy. 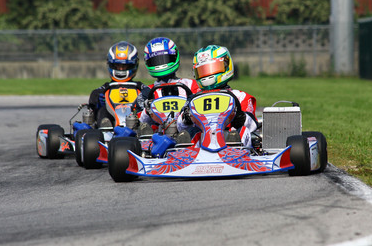 For this competition, in which drivers officially represent their national federations, all the participants are placed on a strictly equal footing with the supply, totally free of charge, of Parolin-FIM karts and LeCont tyres. They were also able to try out their vehicles on the beautiful Friuli Venezia track. The Austrian Max Hofer was fastest at the end of the two Test-Days ahead of the Mattia Drudi (Italy), George Russell and Alex Gill (Britain), Lukas Wenig (Germany), Benjamin Lessennes (Belgium), Alexander Maslennikov (Russia), Javier Cobian (Spain), Petru Gabriel Florescu (Romania) and Lundgaard (Denmark). Times were only indicative and will be confirmed in the first heat of the competition which, like the U18 World Championship, will begin in Portugal (6 to 8 July) before meetings in France (Angerville, 24 to 26 August) and finally in Bahrain (8 to 10 November).